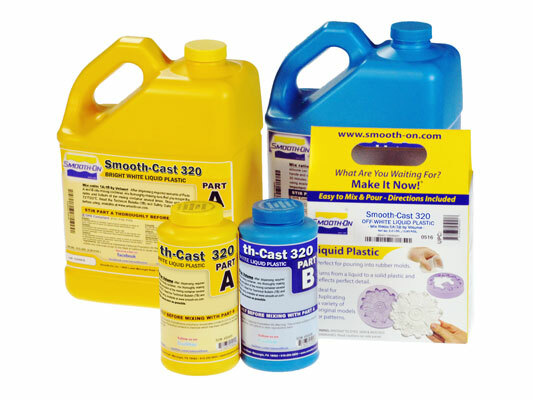 Smooth-Cast® 320 Product Information | Smooth-On, Inc. Specific Volume 26.4 cu. in./lb. Shrinkage 0.01 in. / in. The Smooth-Cast® 320 Series consists of ultra-low viscosity casting resins that yield virtually bubble-free off-white castings. The Smooth-Cast® 320 resins are sister products to our popular Smooth-Cast® 300 Series of bright white plastics, but are easier to color using SO-Strong® or Ignite® color tints. Smooth-Cast® 320 series is easy to mix and pour, offering the convenience of a 1A:1B by volume or 100A : 90B by weight mix ratio. The Smooth-Cast® 320 Series resins readily accept pigments and fillers (such as URE-FIL® 3, 5 and 7 from Smooth-On). Fully cured castings are tough, durable, machinable and paintable. They resist moisture and mild solvents. 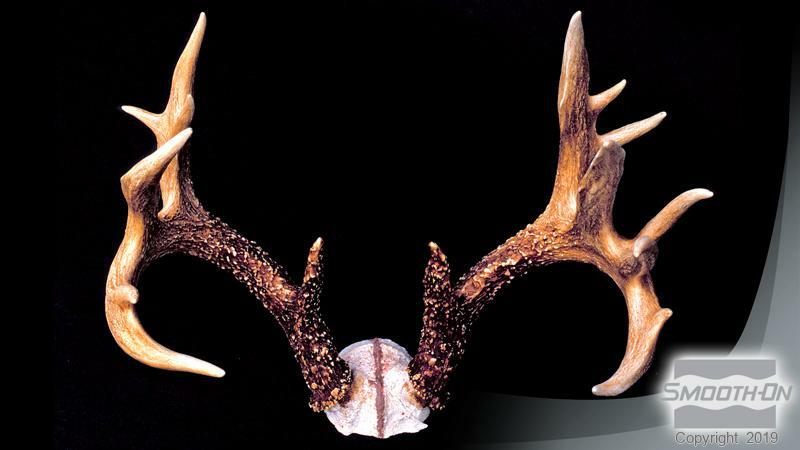 Applications for Smooth-Cast® 320 Series resins include reproducing small to medium size sculptures, making prototype models, special effect props, decorative jewelry and taxidermy (bones, antlers, teeth etc.). Safety - Materials should be stored and used in a warm environment (73° F / 23° C). These products have a limited shelf life and should be used as soon as possible. All liquid urethanes are moisture sensitive and will absorb atmospheric moisture. Mixing tools and containers should be clean and made of metal, glass or plastic. Mixing should be done in a wellventilated area. Wear safety glasses, long sleeves and rubber gloves to minimize contamination risk. Applying A Release Agent - A release agent is necessary to facilitate demolding when casting into or over most surfaces. Use a release agent made specifically for mold making (Universal® Mold Release or Mann’s Ease Release® 200 available from Smooth-On or your Smooth-On distributor). A liberal coat of release agent should be applied onto all surfaces that will contact the plastic. IMPORTANT: To ensure thorough coverage, apply release and brush with a soft brush over all surfaces. Follow with a light mist coating and let the release agent dry for 30 minutes. 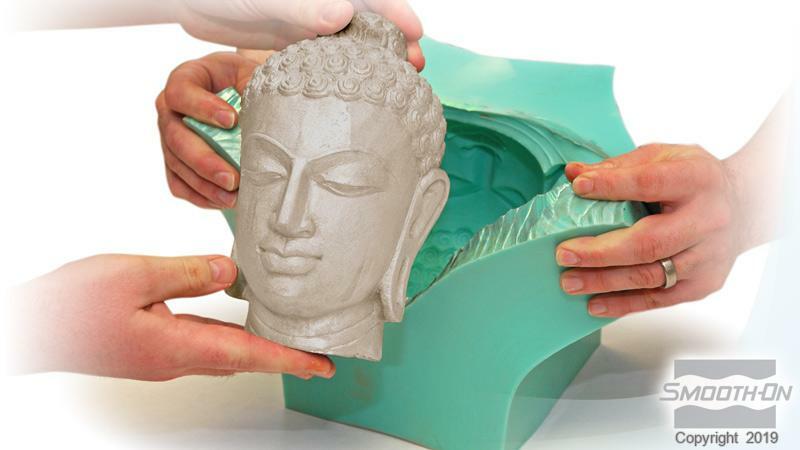 Smooth-On silicone rubber molds usually do not require a release agent unless casting silicone into the mold. Applying a release agent will prolong the life of the mold. IMPORTANT: Shelf life of product is reduced after opening. Remaining product should be used as soon as possible. Immediately replacing the lids on both containers after dispensing product will help prolong the shelf life of the unused product. XTEND-IT® Dry Gas Blanket (available from Smooth-On) will significantly prolong the shelf life of unused liquid urethane products. Liquid urethanes are moisture sensitive and will absorb atmospheric moisture. Mixing tools and containers should be clean and made of metal, glass or plastic. Materials should be stored and used in a warm environment (73°F/23°C). Stir or shake both Part A & Part B thoroughly before dispensing. After dispensing equal volumes of Parts A and B into mixing container (100A:90B by weight) and mix thoroughly. Stir deliberately making sure that you scrape the sides and bottom of the mixing container several times. Be careful not to splash low viscosity material out of the container. Pouring - Pour your mixture in a single spot at the lowest point of the containment field and let the mixture seek its level. This will help minimize air entrapment. For Best Results . 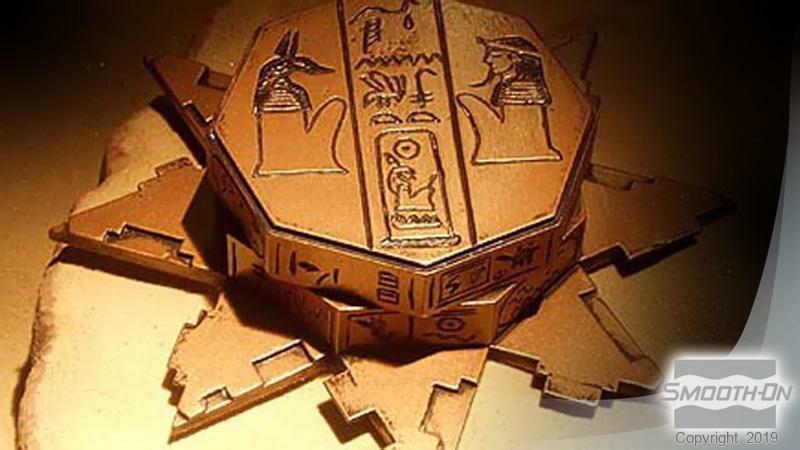 . . Best results are obtained using a pressure casting technique. After pouring the mixed compound, the entire casting assembly (mold, dam structure, etc.) is placed in a pressure chamber and subjected to 60 PSI (4.2 kg/ cm2) air pressure for the full cure time of the material. Demold time of the finished casting depends on mass and mold configuration. Low mass or thin-walled castings will take longer to cure than castings with higher mass concentration. Smooth-Cast® 320 will cure in 7 - 10 minutes (Smooth-Cast® 321 in 30 – 40 minutes and Smooth-Cast® 322 in 2 - 4 hours) depending on mass and mold configuration. If making rotational or hollow castings, backfilling with a rigid foam (Foam-iT!® 5 or other) will provide lightweight reinforcement. 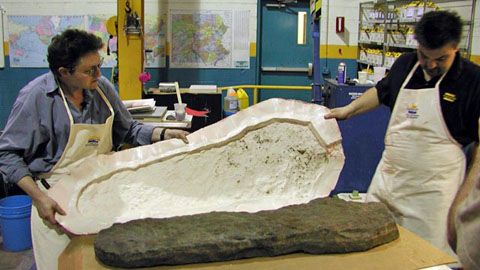 Foam backfilling is recommended if castings will be subjected to temperatures above 85°F / 30°C. Post Cure - Castings will reach “full cure” faster and achieve maximum physical properties if post cured. Allow material to cure for recommended cure time at room temperature followed by 4 - 6 hours at 150°F/65°C. Allow casting to come to room temperature before handling. Performance - Cured castings are rigid and durable. They resist moisture, moderate heat, solvents, dilute acids and can be machined, primed/painted or bonded to other surfaces (any release agent must be removed). If machining cured material, wear dust mask or other apparatus to prevent inhalation of residual particles. Castings can be displayed outdoors after priming and painting. 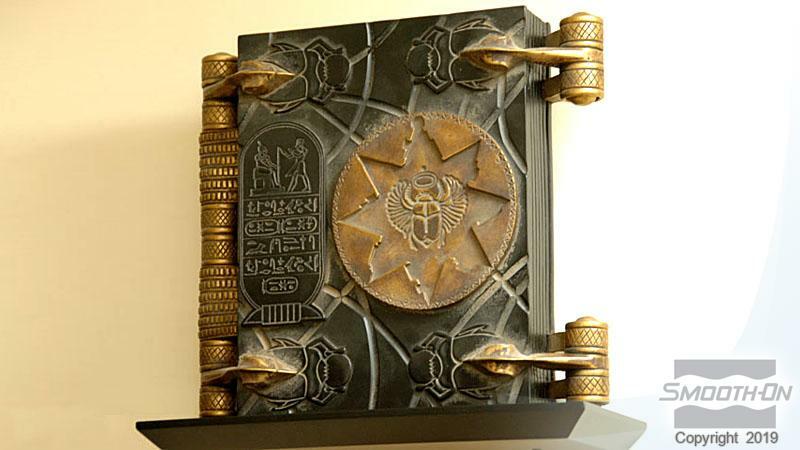 Unpainted castings will yellow over time - more quickly when exposed to ultra-violet light. Because no two applications are quite the same, a small test application to determine suitability is recommended if performance of this material is in question. Read how a reproduction of this historic headstone for display at a local museum is made using brush-on urethane rubber.